In my early-twenties, I was fairly consumed by how I looked. I felt pretty, but only under certain circumstances. I tried very hard to conform to expectations I'd set for myself, but most often felt I fell short. I started running, went down to the lowest weight I'd been in years (in a healthy manner, at least), yet I still looked in the mirror and thought, "Well, it could be better." Nothing was ever good enough, so I'm not even sure what goal I had in mind. I just knew it wasn't where I was at that moment. More often than not, I focused on what my body wasn't and not what it was. 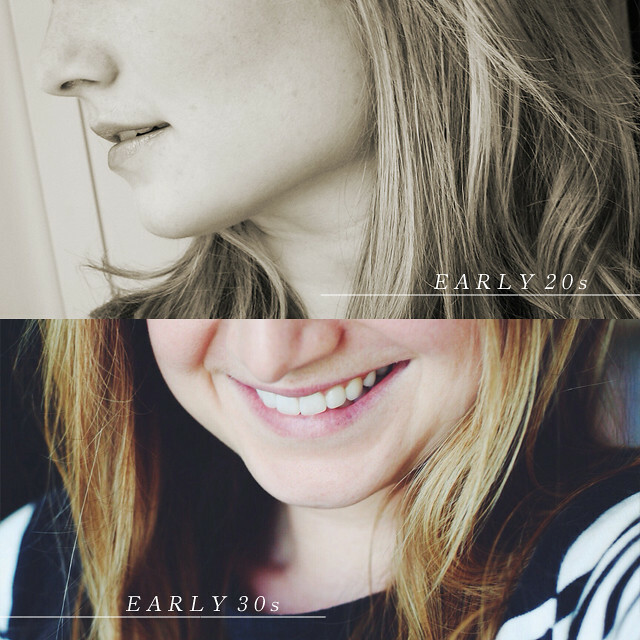 In my early-thirties, my appearance matters so much less. Remarkably so. It's almost unfamiliar, the mostly not caring…the shrugging off of perceived imperfections. It's not a matter of letting myself go and being completely apathetic about physical appearance. Instead, it has more to do with the knowledge that if I don't see myself as beautiful and worthy every single day, I'll never feel it no matter what I look like or feel like. I know this firsthand because I've reached my "goal weight" and had long, blonde hair and all the fixings yet I was still not happy with myself. The number on the scale, my hair color, a less-than-perfect wardrobe, a random breakout—none of these temporary things should have the power to make me crumble as much as I'm afraid they did a decade ago. It's crazy when I realize I'm happier with my body now than I was 20 pounds ago. I definitely have moments of struggle (because who doesn't? ), but more often than not, I'm focused on what my body is and not what it "should" be. In my early-twenties, I tested a lot of boundaries. I tried hard to not be defined as a "good girl" (even though I knew it's who I was at my core, no matter how many times I tried to fight it). I tried on different personalities, in a way—still unsure of who I thought I should be or even wanted to be. I navigated newlywed life. I rediscovered my passion for creativity. I wondered a lot about what I wanted to do with my life. I went out with friends and drank too much, saying and doing things that make me embarrassed to this day (luckily, by most standards, I was still very much a "good girl" and was left with no huge regrets). I tried hard to act like I knew who I was and what I wanted, but I was still in the midst of figuring it all out. In my early-thirties, one word that seems to fit perfectly is: settled. Perhaps not physically (after all, who knows where we will be five years from now as a family!) but definitely when it comes to my sense of self. I worry less about the perceptions of others, I have more confidence, I am less swayed by the opinions of those who don't really matter, I am much more…established, for lack of a better word. I've stopped apologizing (mostly) for things I used to see as flaws: my introversion, my being a homebody by nature, my quirks and natural bents that are so engrained at this point that there's really no use in fighting them. That's not to say I refuse to change at all—believe me, there are still plenty of things I'd love to work on in the decade ahead. But this time around it's not the big things. And that's so reassuring. In my early-twenties, my world was very small. I had just moved from a smallish town in the Northwest to a large city in Southern California. To say it was a culture shock is putting it lightly. Just out of my teens, I was still shaking off those last bits of self-centeredness—realizing that perhaps the world didn't revolve around my hopes and dreams and expectations. I had limited understanding of people different than I was, but I was curious and wanted so much to connect with anyone and everyone. I wanted to learn their stories and see things from a different perspective. I hadn't been faced with many tragedies or real struggles…life was still very simple and easy. I still believed in happily ever after and the good guy always coming out on top. In my early-thirties, my world is much larger. Part of me misses the naivety of the girl I used to be—the one who genuinely believed that people were all good at their core, and that things always worked out in the end. In the past decade, I've learned a lot about tragedy and real struggles. I've seen those close to me suffer through things like addiction, depression, infertility, infant loss, divorce, the death of a parent. I've learned that life isn't always filled with happily ever afters, and there are things that each of us will face in our lives that we never anticipate. I often feel weighed down by many things I can't fix, but I am learning to let go of some of that responsibility. People aren't perfect, everyone gets hurt, there are things we can't control, the good guys don't always win, and life certainly isn't a perfect storybook. But now I know it wasn't meant to be one. And that's okay. In my early-twenties, I dreamed of having a fancy camera and learning more about photography (but mostly just played around with our cheap point-and-shoot). I dreamed of creating things to sell (but never thought it was an actual possibility). I dreamed of writing, creating, of being published (but didn't think it could happen for a regular girl like me). I dreamed of becoming a mom (but it seemed so far away that I couldn't imagine it as a reality). I dreamed of becoming a runner (but knew it was so out of my nature that it would never happen). In my early-thirties, I'm nothing short of amazed by what the past decade has been filled with. I have learned to love photography and am able to take photos that I'm actually quite proud of. Although my Etsy shop has been on the back burner these days, I've sold over 700 items in the past 8 years. I worked as a freelance editor for a while and even had my artwork published in a collaborative book (some of my lettering is being published in another book being released this year, as well, which is definitely a childhood dream come true!). I am the mom of a sweet little firecracker named Eisley, and soon another daughter will join our family. It's also worth mentioning that my husband and I will celebrate ten years of marriage (whaaaat?!) next February. And as for running, although it's been an on-and-off journey for the past handful of years, I can say that I've actually run 3 miles straight—something I never would have believed possible a decade ago. As for the future, I have a lot of new dreams. I dream of having a home for our family—one with a yard, a garden, a cozy fireplace. I dream of maybe having more children. I continue to dream of a big move back to the Northwest, where both my husband and I grew up, so we can be closer to our families. I dream of writing a book, bringing in an income for our family while working from home, making a difference in some way, running a 5k, going on some sort of grand adventure. The past years have been so blessed and beautiful—hardships and all. Everything that has filled those years make me want to dream bigger and hope for more, all while forever stopping to be grateful for every little thing that has made me who I am during this season of life. wow, this was such a heartfelt post. i enjoyed reading every word of this post. I have been a long time lurker on here. and this was such a genuine insightful post that i had to comment. thanks for letting us readers in to yoru world! I love everything about this post. It rings so true (although I'm 36 :) about perspective. You are inspiring in many ways and I wish you the best!